You spend a lot of time documenting all the aspects of your websites, taking notes on your business, or crafting your latest blog posts. You want to write in Markdown, but why do you need to read it that way? Versatil renders your text when you're not editing it, allowing you to read and reference it in a more beautiful and natural way. If you're not editing it, then you're seeing it beautifully displayed. 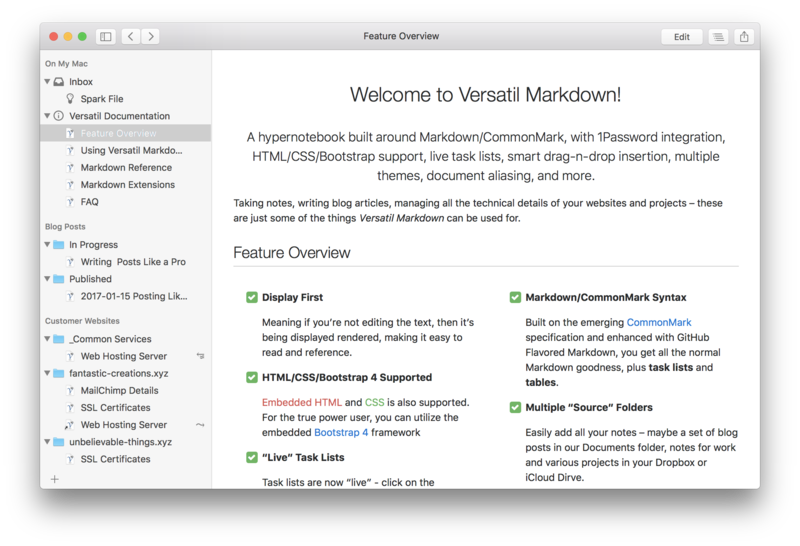 Whether you’re keeping track of the technical details of all the websites you manage or storing thoughts on various projects, you can write it in the familiar Markdown syntax. 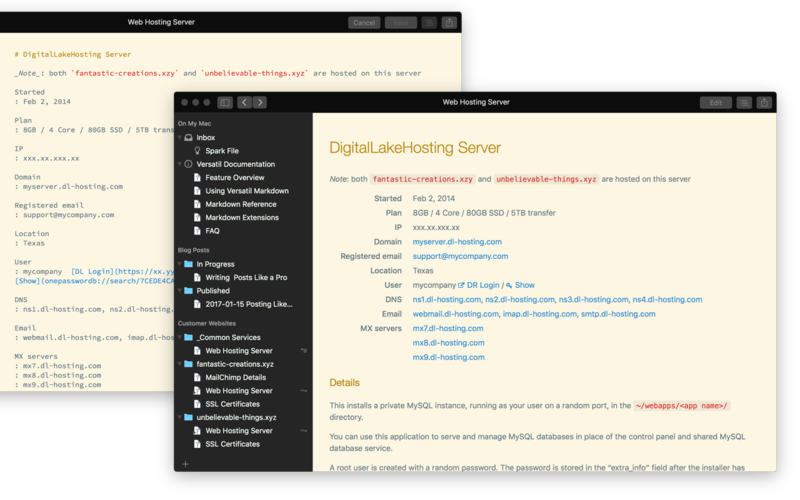 Built on the emerging CommonMark specification and enhanced with GitHub Flavored Markdown, you get all the normal Markdown goodness, plus "live" task lists and tables. Common Sense Drag/Drop — drag a link or an image from your browser into your text, and have it inserted as a proper link or image. Stored as Text — your data is stored as plain text, so you're not locked into a difficult to access format. Embedded HTML and CSS is also supported. So if you want to add special sections or formatting, go right ahead. For the true power user, you can utilize the embedded Bootstrap 4 framework. Although your source might not render correctly in other Markdown editors (without the proper support), the power is there if you wish to take advantage of it. 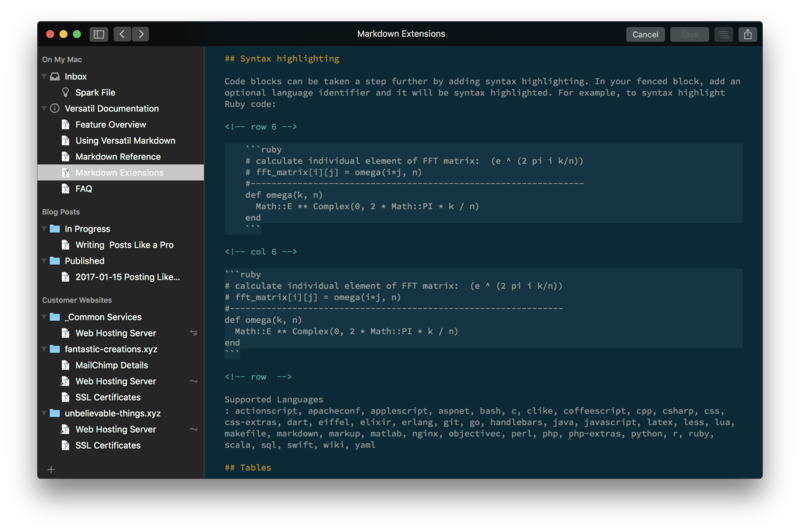 Syntax Highlighting — For all those code snippets and Bash recipes, have it nicely syntax highlighted for easier reading. 1Password Integration — If you use 1Password to store your logins to various websites, you can easily create a link to one of these sites. 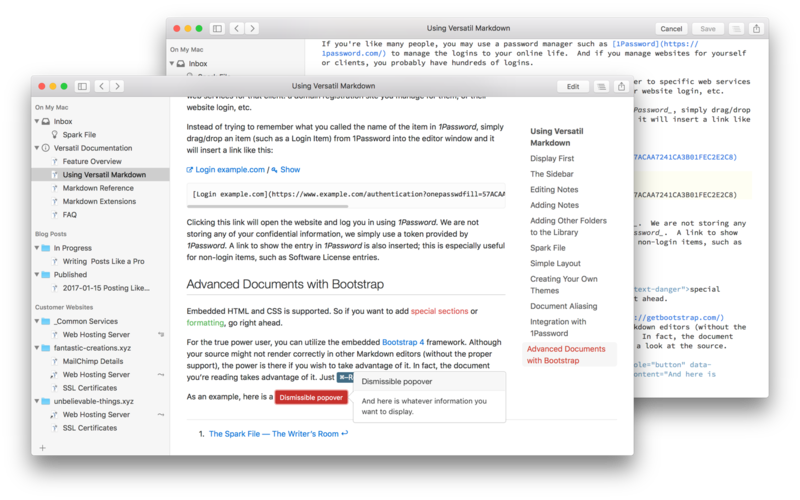 Document Aliasing — Sometimes information belongs in more than one place. Create aliases to virtually place a note in any section/folder where it needs to be, and edit a note from any of its aliases. Multiple "Source" Folders — Easily add all your notes – maybe a set of blog posts in our Documents folder, notes for work and various projects in your Dropbox or iCloud Drive. Sparks — An easy way to chronicle/journal and capture thoughts or ideas through the creation of "sparks". Each spark is stamped with a date and time and kept in chronological order, so you can quickly browse through them.